There are two forms of ATR’s Integrated turbulence cockpit displays. 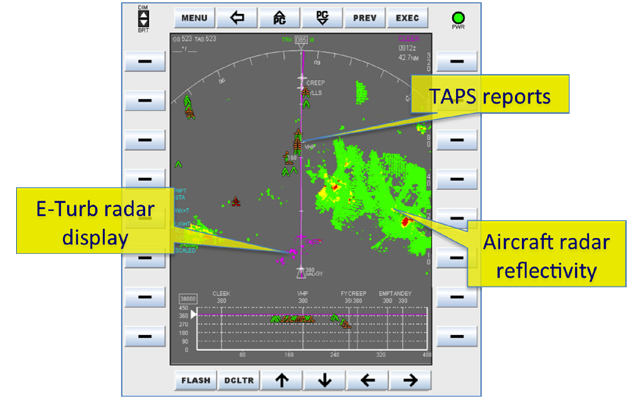 The first fuses convective turbulence information from AeroTech's Enhanced Turbulence (E-Turb) Radar algorithms, turbulence encounter reports from AeroTech's Turbulence Auto-PIREP System (TAPS), radar reflectivity, and aircraft navigation information. The unique aspects of the E-Turb and TAPS products ensure that a specified turbulence severity from one source means the same thing as the same turbulence severity level from another source. The integrated display provides greatly improved awareness of turbulence and weather hazards on a pilot friendly and intuitive display. In addition to fusing the E-Turb and TAPS data in an integrated display, ATR has also developed enhanced turbulence displays for Electronic Flight Bags as shown below. These solutions have been evaluated in simulators, and can be implemented on either Class II or Class III devices. 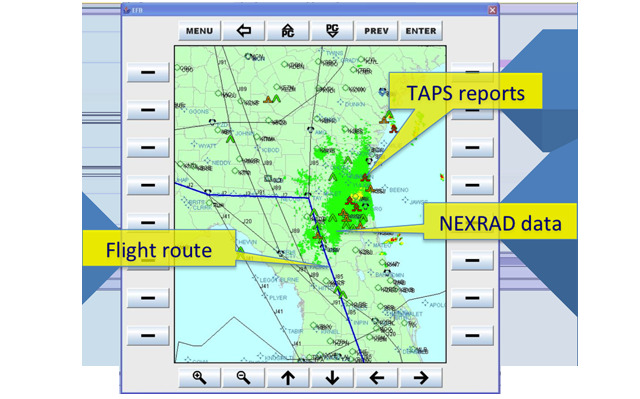 • Range limitations inherent to Doppler radar systems mitigated by incorporating TAPS information. • Multiple sources of turbulence information are combined in a seamless, consistent manner. • Enhanced awareness of turbulence in graphical formats. • Readily integrated with other EFB applications.